Although Spanish wine is without doubt the star of the country's alcohol industry, there can be no doubt about the fact that the next favourite is cava. Originally being a copy of French Champagne, Spanish cava has outgrown this status and become a famous drink all on its own. It also has a number of great cellars and bodegas across the country. What better way to discover and visit Spain than to learn about one of the national drinks. One of the great things about Cava production in Spain is the fact that it uses a number of different processes to that of wine, and so even the most knowledgeable person on Spanish wine will still find a trip around a Cava cellar interesting. Furthermore, as Cava is such a prestigious wine, many of the cellars are extremely beautifully decorated meaning that you will experience an excellent combination of great wine, great art and great architecture. The Freixenet cellars came about thanks to the union of two Spanish families who each has a long history of winemaking: The Ferrers, who owned the farming estate known as La Freixeneda, and the Salas, the founders of the wine exporter Casa Sala. It was during the latter years of the 19th century that Pedro Ferrer Bosch from La Freixeneda married the granddaughter of the founder of Casa Sala, Dolores Sala Vivé. At this time, many of the country's vineyards were destroyed due to the phylloxera plague and so, inspired by the success of the region of Champagne, the family began to plant white grapes like Macabeu, Parellada and Xarel·lo instead for use in the production of sparkling wines. Today, these are still the main types of grapes used to produce Cava. A tour of the wine cellars will be lead by a local guide who will begin by telling you of the family history before taking you to the old cellars to learn about how Cava is produced. After this you will take a train ride through a section of the underground cava cellars which extend over a distance of 20 kilometres (12 miles). A tasting session will follow where you can try out some of the different cavas that the company has to offer. Finally, a trip to the cellars' shop means you can pick up a few bottles of your favourite cavas. The history of the Codorníu family's wine business can be dated back to the 16th century as there are documents that state that the family owned a number of machines and other items relating to the wine industry. We also know that in 1659, Anna Codorníu married Miquel Raventós, who was a member of another great wine making family. The two united families were therefore united. In 1872, cava began being produced in Spain copying the method used to produce Champagne. The decision was then taken by Manuel Raventós to build the cellars at Sant Sadurní d'Anoia, which at the time were considered far too big for the company's production rate - around 100,000 bottles of cava per year. Furthermore, the winery was located away from transport links and instead was built closer to the winery as Manuel believed that the proximity would help to improve the quality of the wines. 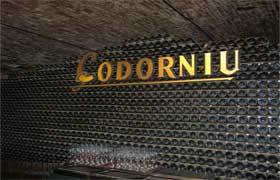 In 1976, King Juan Carlos I of Spain declared the Codorníu cellars as a 'a National Monument of Historical and Artistic Interest'. Today, they still control all elements of the cava production process, from vineyard to the end product, and make use of some of the most up to date equipment to ensure the quality of their cava. A guided tour will be lead by one of the Codorníu's own guides who will take you around the underground cellars, beautiful gardens and interesting Art Nouveau style buildings. 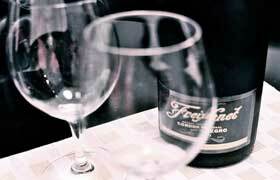 Throughout the tour you will discover the history and production of their famous sparkling wine. There will be a tasting session at the end of the tour as well as a trip to the shop. Both of these cava cellars are extremely famous and as such, are used to welcoming foreign visitors. English tours are normally provided but this may not always be the case. Therefore you may want to consider attending a Spanish language school in order to brush up on your Spanish before heading to the cellars. Furthermore, your tour guides may appreciate it if you spoke a little bit of Spanish!